Biking down the Galloping Goose Sunday on my way to the excellent Panama Flats park, I came up on the intersection of the Goose with Tillicum Road, and traffic on Highway 1 (running parallel to the Goose) was flowing. It was in the middle of a minutes long traffic cycle, the appropriate time for people on foot and on bikes to be moving through unimpeded. Except, that orange stick figure was telling me I should not go, which meant I had to push the “Beg” button first. Voila, the orange stick figure was replaced by the white one telling me I could cross. Of course I could cross, I was moving in the same direction as traffic and it was logical! Why was this even an issue? 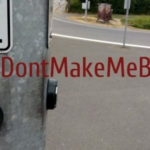 I abhor beg buttons, and here’s why, this has been documented repeatedly. I’ve written many an unpublished diatribe that had those exact same words! Especially here in Victoria, pedestrians take first priority, then people on bikes (pdf), all prioritized above car traffic in the official community plan. This is true in Saanich as well. If that is the case, and our municipalities were serious about improving the non car driver’s experience, then they need to aggressively retire all beg buttons. Remove them, or note that they are not to be used. I’ve of course heard anecdotal information from people in engineering/planning that they are disabled in some places. That’s not good enough. If you are going to disable a button, you need to label it as so, say DO NOT PRESS! And, while you’re at it, time your pedestrian crossing signs to maximize crossing time. I’m tired of seeing “Do not Walk” signs come up a good twenty seconds before car traffic stops, this is not necessary, and harkens back to a car first mentality that needed to have gone away with the 20th century. Why, I crossed a 3 lane (+ wide turning cuts) in Sidney at a deliberate saunter starting after the “Do not walk” (not the warning) had come on and still had a good few seconds before the car light changed to red. Victoria is getting better, but there are still too many intersections where cars are prioritized. Take Fairfield and Moss, corners are two shopping/office blocks, a church and a busy community center/child care. But, guess what, there’s beg buttons still, and certain times of the day when crossing Fairfield is something you have to accomplish in 10 seconds or less. Completely unnecessary. Time for a campaign to Retire the Beg Button at traffic lights and move them all to mid block crosswalks where we can cross the road by pressing a button that will make cars stop for a few seconds.